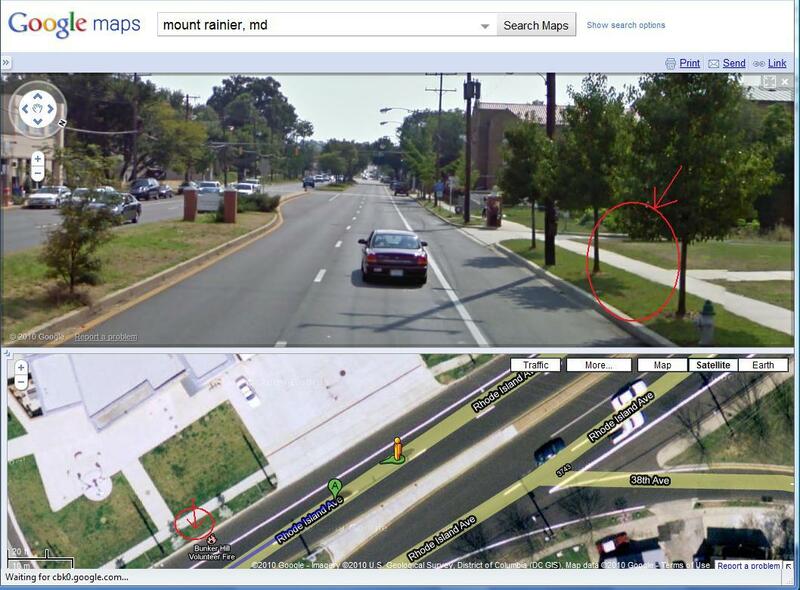 T he town of Mount Rainier recently began using a speed camera on the 3700 block of Rhode Island Avenue (US Route 1). 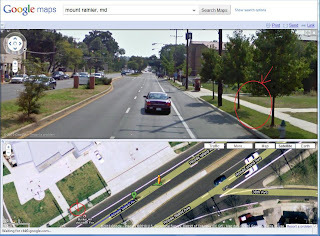 StopBigBrotherMD has discovered that the speed limit at that camera site was recently lowered by 10mph, from 35mph to 25mph. Photos taken in the first week of August by a concerned citizen show the 25mph speed limit just north of 37th street. The speed limit north of the current camera site is 35mph, with the camera site located about 45 yards south of the 25mph sign (marked on the photo below, partially concealed by trees and other obstacles). An image extracted from Google street view shows the same site taken before the camera deployment. Notice that the 25mph sign is not present in these legacy images. 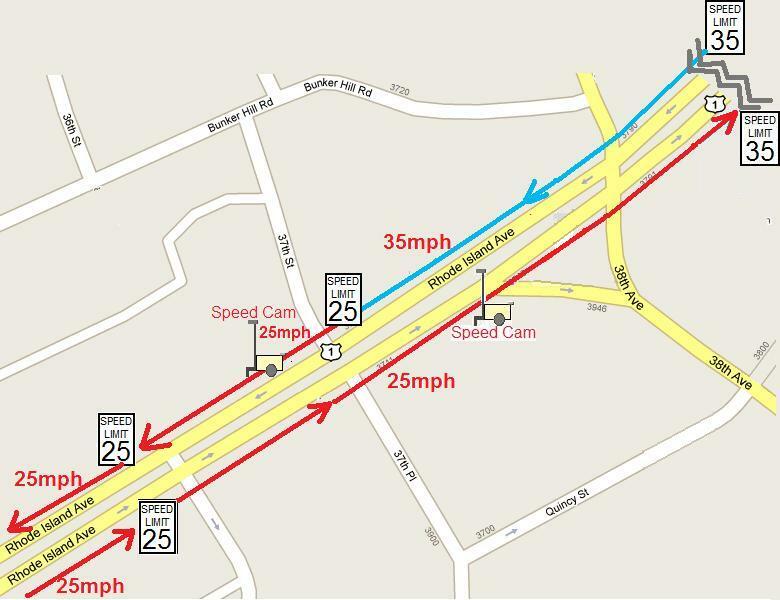 A 25mph zone did exist previously on Rhode Island Avenue southbound, but started south of 37th street, approximately 500 feet south of the point where it is at now. Before the new 25mph sign the speed the limit in the section around the camera was still posted as 35mph. We also discovered that there was previously a 35mph speed limit sign just south of 37th street in the northbound lane, marking the (former) end of that 25mph zone. Now that sign was removed and has been replaced by a 25mph sign a short distance away. 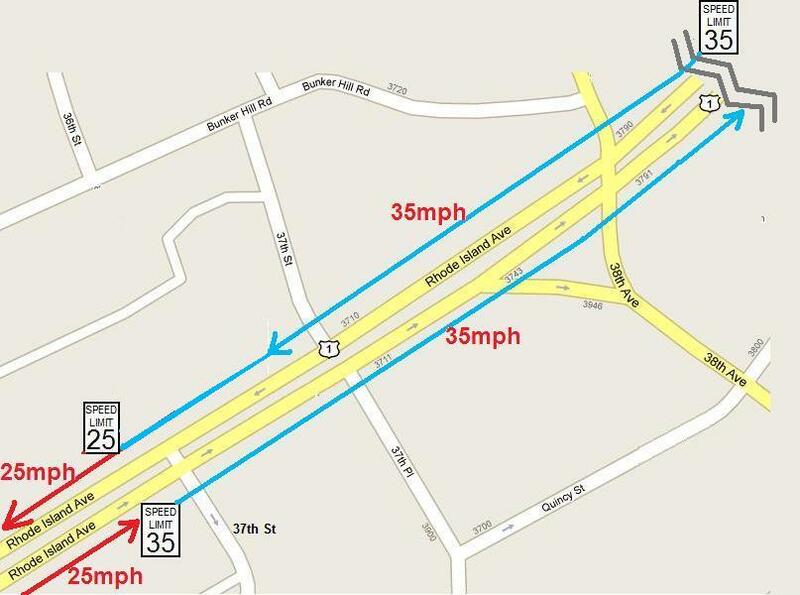 The next-door town of Brentwood has been using a camera at 38th street in the northbound lane, enforcing the 25mph speed limit in the area formerly marked as 35mph as the drivers are exiting the newly created school zone. It is unclear exactly when these speed limit signs were changed. StopBigBrotherMD attempted to acquire the SHA permits to see if we could confirm when this change took place and the precise location of the old and new signs. However so far those efforts have been unsuccessful. We requested these records from the SHA and the town of Mount Rainier but received no response after two business days. We have also been contacted by a citizen who made an official Maryland Public Information Act request to the town of Brentwood for their SHA permits and permit application; that MPIA request was denied by Brentwood police, who responded that the documents were “privileged information” and that they would only turn these records over in response to a court order. For lack of access to the official traffic diagrams in the permits here is our illustration of the change to the speed limit zones and signage. This no doubt has produced a bumper crop of $40 tickets for Mount Rainier and Brentwood from drivers if they were assuming the old speed limit out of habit. Prior to 2010 there were no school zone signs located in this area (school zones do not automatically exist around schools according to SHA publications regarding Maryland state law). When the cameras were deployed a sign was added stating 'photo enforced 6am-8pm M-F'. However this sign is not a S1-A1 sign called for in the SHA publication regarding school zone speed cameras, and the word 'school' still does not appear on any of the new signs posted in the school zone. There is a small Private Montessori school located right at the old start of the 25mph zone (south of 37th street east). However even if one assumes the location is a legitimate school zone now, there seems to be no reason why it should not have been two years ago, or that the same speed limits which are appropriate now should be different from that time, since the school has been there for many years. 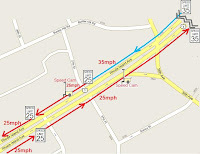 It is notable that the northbound lanes, heading AWAY from the school NOW keep the 25mph zone in effect well north of where the 25mph zone starts in the southbound lane heading TOWARDS the school, and seems to serve no purpose other than to permit Brentwood to photo-enforce a 25mph rather than a 35mph speed limit. Brentwood also appears to have altered the speed limit on at least one local road. According to a report by the Mount Rainier police to their council "The Town of Brentwood has changed the posted speed limit on westbound 34th Street from 25 MPH down to 15 MPH. Brentwood's Chief of Police has informed me that the Town intends to install a speed camera just west of Upshur Street to enforce this new 15 MPH speed limit." We had previously reported that the nearby town of Cheverly had also lowered speed limits on most of its roads shortly after approving speed cameras, reducing the speed on many local streets by 5mph, in some cases down to 15mph. Cheverly is seeking to place a speed camera on state highway 202. Mount Rainier reached an agreement with the town of Brentwood to divide up the revenue from the Rhode Island Avenues speed cameras. Mount Rainier collects the fines from the camera located at the 3700 block southbound while Brentwood collects the revenue from the camera located at the 3800 block northbound. Both towns have speed camera contracts with Optotraffic/Sigma Space, which receives a portion of the revenue from each ticket. In addition to providing, maintaining, and processing violations from the cameras, Optotraffic also conducted the traffic study which determined the potential camera sites. Optotraffic also apparently helped write Mount Rainier's application for a speed camera permit, based on minutes of a January 2010 Meeting which stated "We are still working with Opto Traffic to get our permits from State Highway Administration to put our cameras on Queens Chapel Road and Rhode Island Ave."
According to the town newsletter, Mount Rainier began its legally required 30 day speed camera warning period in December 2009. The camera issuing warning during that period was deployed in a pre-existing school zone on 34th street, a narrow road in the middle of town primarily used by town residents rather then commuters. Immediately after the warning period ended, the camera was moved to Arundel Road between 32nd and 34th Streets. In the beginning of June, after the SHA approved the Rhode Island Avenue location, a camera was placed there to ticket the more profitable commuter traffic on that street. 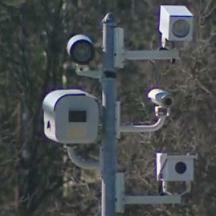 Another camera site has also now been placed on Queens Chapel Road. We will be following up on this story as we get more information. In the meantime, we would like to remind citizens who have concerns about these camera programs that those concerns or criticisms are best sent to the lawmakers and elected officials who authorized the cameras, rather than the police who implement policy.